Hurrah for OpenSource free translation software! The German translation community certainly benefits from the work of program developers who make their work available to everyone. 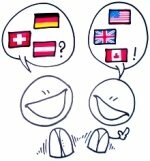 The following is a selection of language translation software free to download, which will help the work of German translators. 3. Olifant (http://okapi.sourceforge.net/Release/Olifant/Help/) is a .NET application that allows you to load or import translation memories in different formats (such as TMX or tab-delimited). You can edit the translation units, their attributes and any other associated data. Olifant allows you to save or export your data in various formats. 4. Anaphraseus (http://anaphraseus.sourceforge.net/) is a CAT tool for creating, managing and using bilingual Translation Memories. It is an OpenOffice.org Basic macro set available as an OpenOffice.org extension or a standalone document. Originally developed to work with the Wordfast TM format, it can also export and import files in TMX format. 2. Audacity (http://audacity.sourceforge.net/) – free open source recording and editing software. 4. Catcount (www.catcount.com) - a word count tool for counting words translated using a variety of CAT systems, where repetitions are charged at different rates. I'll be adding additional tools whenever I find something worthy of note - so watch this space!